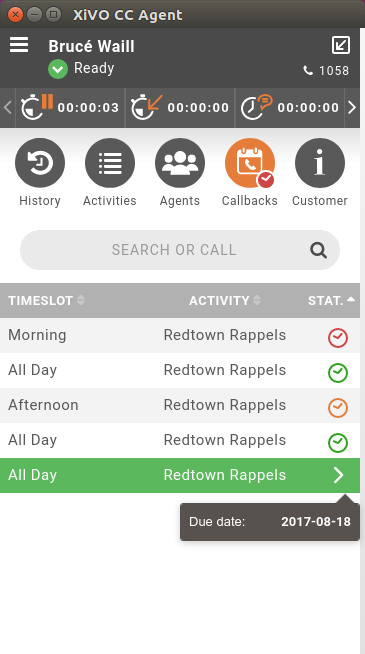 The goal of the callback system is to be able to perform scheduled outgoing calls. These requests can be completed with specific information such as a description or a personal name. Each callback request is associated to a predefined callback period, which represents the preferred interval of the day in which the call should be performed. A callback request cannot exist on its own: it must be stored in a callback list, which is itself associated to a queue. Once created, a list can be populated whether through the Callbacks tab of the CCManager, or programmatically through the web services of the configuration server. A callback period represents an interval of the day, bounded by a start date and an end date. It can be set as the default interval, so that a newly created callback request will be associated to this period if none is specified. Using the CCManager callback view you may import a list of callbacks, monitor callback completion and download the associated tickets. Callbacks can be imported from a CSV file into a callback list. Line delimiter must be a new line character and column separator must be one of: ‘|’ or ‘,’ or ‘;’. Columns can be optionaly enclosed by double-quote ‘”’. When an agent takes a callback, the column Taken by is updated with the number of the agent. The callback disappears when it is processed. The tickets of the processed callbacks can be downloaded by clicking on the Download tickets button. The downloaded file is a csv file with the comma ‘,’ as delimiter. The agent can see the callbacks related to the queues he is logged on. They are available in the Callbacks menu. A notification is also shown to display pending callbacks in menu to know status at any time and from any other screen of the application. To process one of these callbacks, the agent must click on one of the callbacks line. To launch the call, the agent must click on one of the available phone numbers. 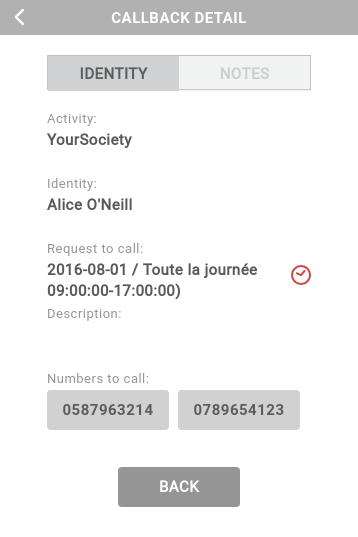 Once the callback is launched, the status can be changed and a comment can be added. Clicking on the calendar icon next to the “New due date” field, will popup a calendar to select another callback date.